It is reported that various types of terror arms were captured in the house of Yuannis Kotsapas, a wealthy Greek Cypriot merchant. Kotsapas was arrested. The police found 24 hand bomb, 24 smoke bomb, 1 anti-tank mine, approximately 300 libra nitroglycerine blaster, 100 explosive fuse, 100-ft long detonator, 2-inch mortar shell, 4000 rifle bullet, 500 gun bullet and a large amount of supplies for bomb making. The police has also taken safety measures at harbors and Nicosia airport to prevent arms-smuggling. 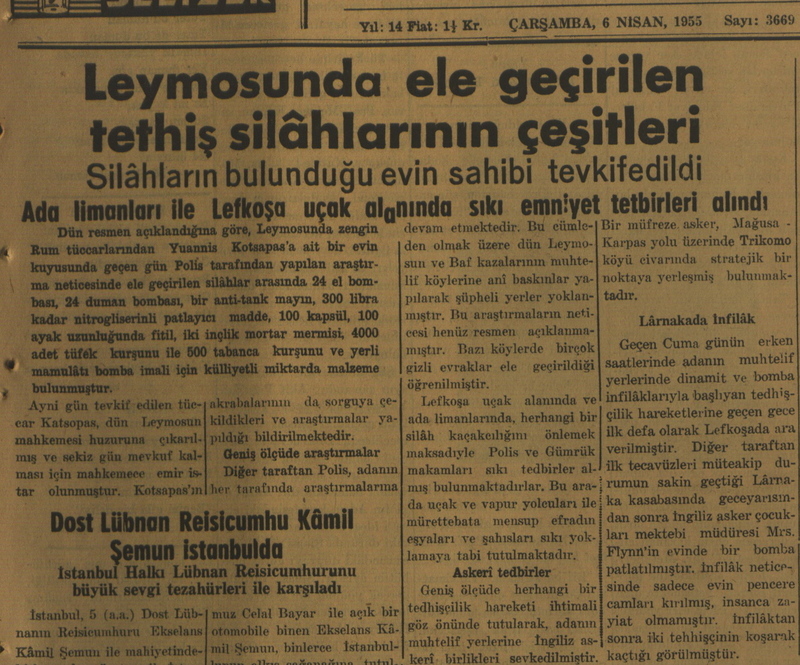 "Leymosunda ele gecirilen tethiş silahlarının çeşitleri" in Halkın Sesi, April 6, 1955, p.1. R.H., “Report on the arms captured in the house of Greek Cypriot merchant in Limassol, 1955,” Cyprus Critical History Archive: Reconsidering the culture of violence in Cyprus, 1955-64, accessed April 25, 2019, http://ccha-ahdr.info/items/show/13.